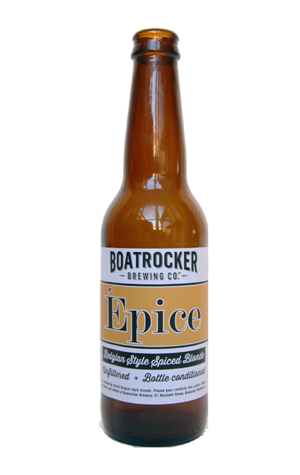 Anyone that called into the 2016 Good Beer Week Gala Showcase and stopped by the Boatrocker stall will be aware that they've got plenty of new beers on the go in various stages of readiness. The combo of in progress beers, ready now beers and been around a while beers saw the Braeside brewery take a fourth straight People's Choice title, with the Epice one of the beers that contributed. It's another beer that looks to Matt Houghton's beloved Belgium for inspiration: a blonde ale that, like many beers you'll find in the European country, isn't afraid to add some spice to the mix. Here, he's gone for star anise plus some fresh orange peel. The former is a spice that past experience suggests needs to be handled with kid gloves or else it dominates and, while it is more prominent on the aroma than the peel, it remains subtle. The beer was finished with a champagne yeast, the intention being to give it a "moussey" mouthfeel, according to the brewers. Before receiving that info from them, we'd written "pillowy" in our notes so it's safe to say they hit the mark. There's a prickly carbonation to help it dance across the palate, while some delicate sweet malts are at play too.